I’m someone who LOVES Christmas decorations. The holiday, which was my dad’s favorite, make me feel warm and happy and closer to him than at any other time of year, and I want my home to express some of that happiness of the season. Of course we always have a Christmas Tree (you can see this year’s beautiful tree from Weir Tree Farms below), and we hang stockings by the chimney (with care!) but I’m always looking for ways to bring a little more of that Christmas spirit into my home without covering every surface with clutter. I want my home to feel festive, but still restful. 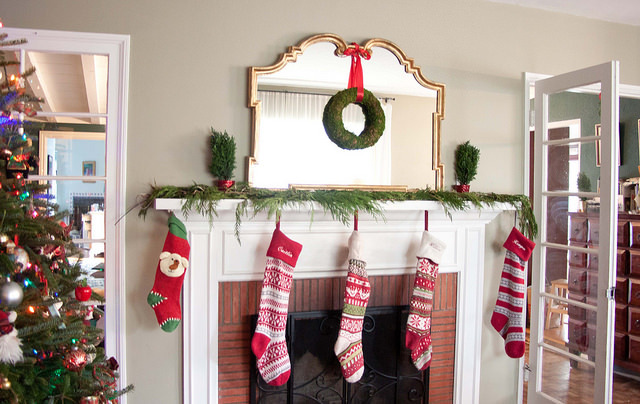 Without going to the lengths of decorating the bathrooms for Christmas per my 7 year old’s request, here are five ideas to bring a little more Christmas spirit into your house, with some pictures of our decorations this year. Light fixtures are begging for a little bling this time of year. 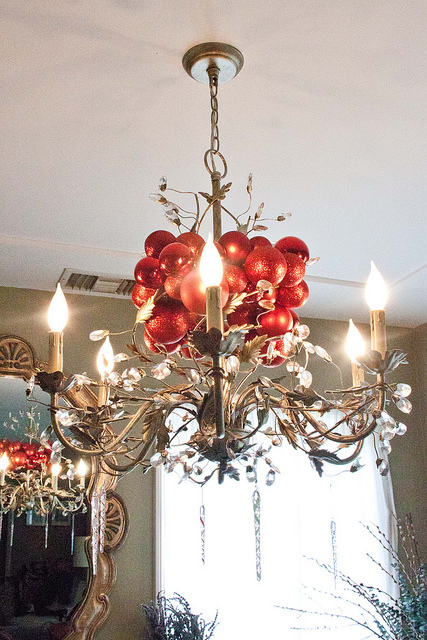 Something like these shiny balls reflects the light from the chandelier and makes the whole thing a holiday showpiece. Chandeliers in particular also are great with some hanging ornaments, like these glass icicles. 2) Hang lights in unexpected places. I love the look of Christmas lights when they’re lit, but the strands aren’t exactly my cup of tea. 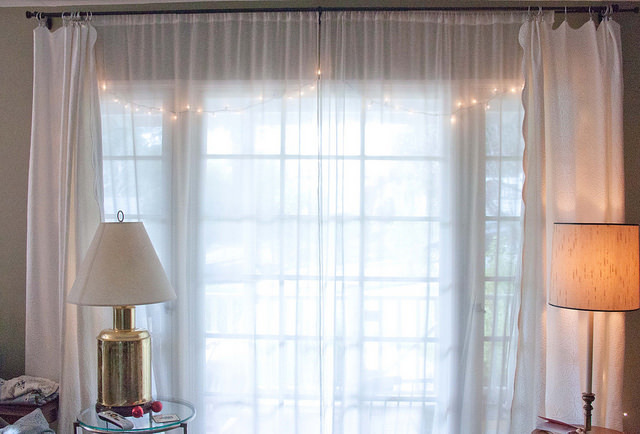 We hung this strand of lights in the window under the curtains, and you can only see them when they’re turned on. You can see them through the sheers, but behind the other curtains, they give a wonderful warm glow. We always keep a few cushions on the sofa, and this time of year, replacing the covers with holiday-themed covers is an easy way to bring in a little more holiday cheer. I just keep the regular cushions and add a case over them. 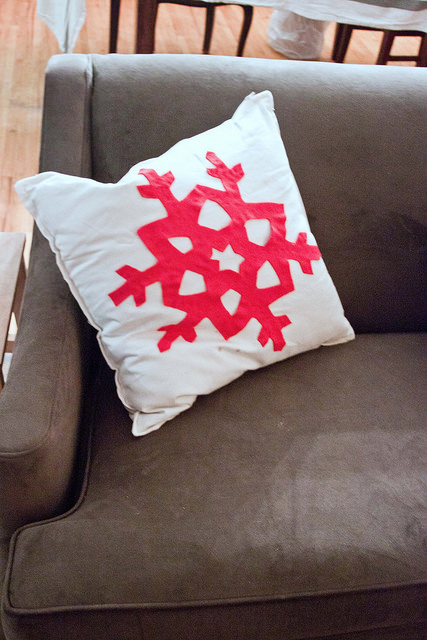 This year I couldn’t find my regular holiday cushion covers, so I made some by appliqueing snowflakes I cut out of felt onto plain white $6 cushion covers from Ikea. We don’t hang up holiday paintings this time of year, but an easy way to make your existing decor a little more festive is to hang wreaths from ribbons in the center of your existing frames – effectively framing the wreaths. We have them on the mirrors in the living room, but also hanging over some large scale art in the library and bedrooms. 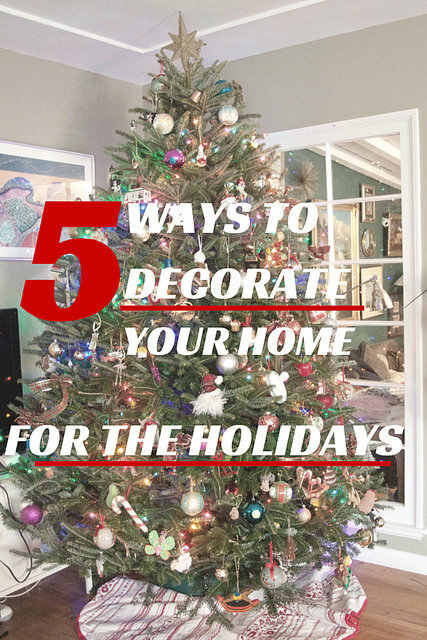 Decorations are about the way a home looks, but they’re also a way to entice people to linger in a room. 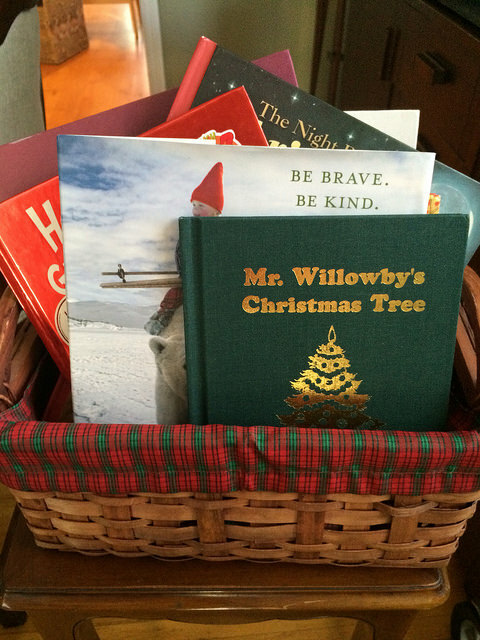 I’m always a fan of the aesthetics of books, and at Christmastime, I bring out a pile of colorful Christmas-themed books, pop them in a holiday basket, and put them near the tree. We sit by the tree and read Christmas stories and enjoy our home and each other – and that’s really what the Christmas season is all about! 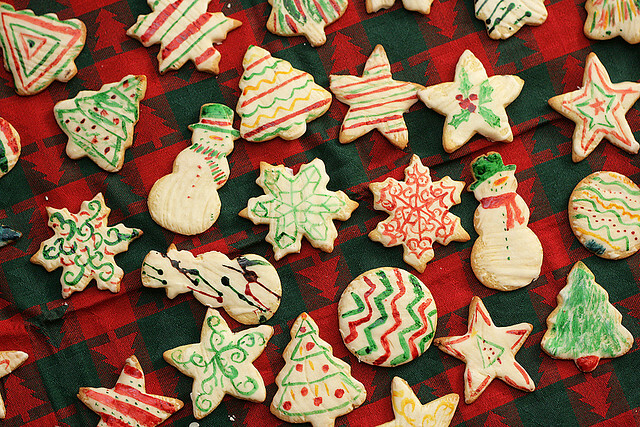 Do you have any great ideas for easy ways to make your home festive for the holiday season?